NVCleanstall is a free program for Microsoft Windows devices to customize the installation of Nvidia video card drivers on the device. Nvidia's driver package for its video cards seems to grow larger with every release. What started as an option to install specially optimized video card drivers has turned into several hundred Megabytes large installers that install all sorts of needed and unnecessary things on systems. It is highly recommended that administrators install only the parts of the Nvidia driver that are needed; it is necessary to customize the installation for that and while Nvidia's installer offers some customization options, it is not nearly as fine grained as third-party programs that you can use for the same task. Third-party tools like NVSlimmer ensure that you install only the parts of the driver that you require. You save hard drive space, speed up the start of the system, and remove telemetry that gets installed usually. NVCleanstall is such a tool. It is released as an alpha development version currently. You should not run it in production environments because of that even though it worked fine on two machines, one Windows 7, the other Windows 10, I tested the application on. It is recommended that you remove the current Nvidia driver installation completely before using NVCleanstall to install an optimized driver package. Install best driver for the detected Nvidia hardware. Manually select a driver version. Once you have selected an option you are taken to the next screen. 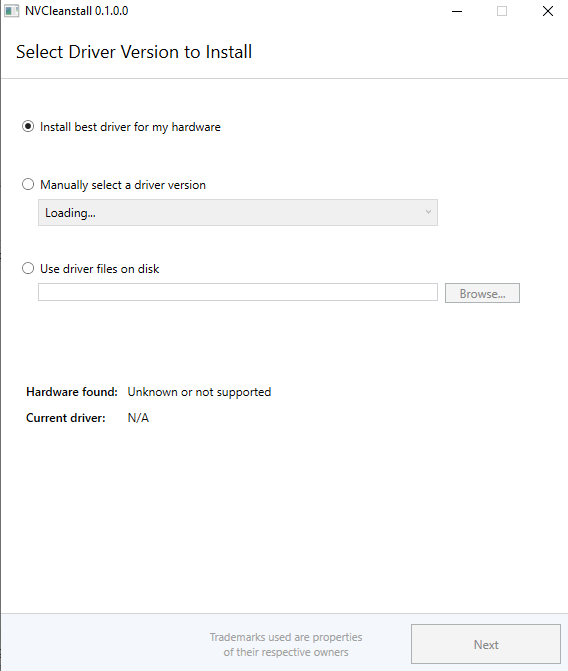 There you may select the components to install and the driver components that you don't want installed. Descriptions and dependencies are displayed for each component that is detected by the program. The application separates GeForce Experience related tools and options from the rest. The only component that needs to be installed is the display driver; any other component is optional and does not need to be installed but you can enable it for installation easily by checking its box in front of the component listing. You can go through the components one by one and select only those that you want installed. NVCleanstall offers three sets of configuration -- all, recommended and minimum -- that you may activate to speed up the process or start using a preset. It is recommended that you install only those components that you require. One option that you have in this regard is to install the minimum number of components and verify whether everything works as intended. Just run the program again to install components that you require if you run into issues. NVCleanstall is a promising program that gives you full control over the Nvidia driver installation process. It is a tool for advanced users who know which components they require and which they don't require. One to look out for to see if it reaches a stable release eventually. Now You: do you install drivers separately? Looks nice, but I’ll probably stick with the official driver installer to avoid any potential problems these custom installers may create. At least until this one is fully tested and whatnot. I wish Nvidia would expand manual installation options. I can understand telemetry but I have no use for Shield or Miracast for example, yet I’m still forced to have them on my system. Interesting, I wonder if there is such software for AMD drivers. Their install is smaller but also full of bloatware. This looks really handy, I hate the telemetry part and GeForce Experience. I actually have one such driver that I’ve downloaded from the nVidia website, I removed the telemetry part and GeForce Experience, archived it and uploaded it on my MEGA.nz account for safekeeping. Windows privacy, browser settings (about:config, userchrome, add-ons) and whatever else happens to occur with all the other software. That’s a full-time job by now… Really, how much time we loose? A lot more than we should. The NVCleanstall depends on Microsoft .NET Framework. 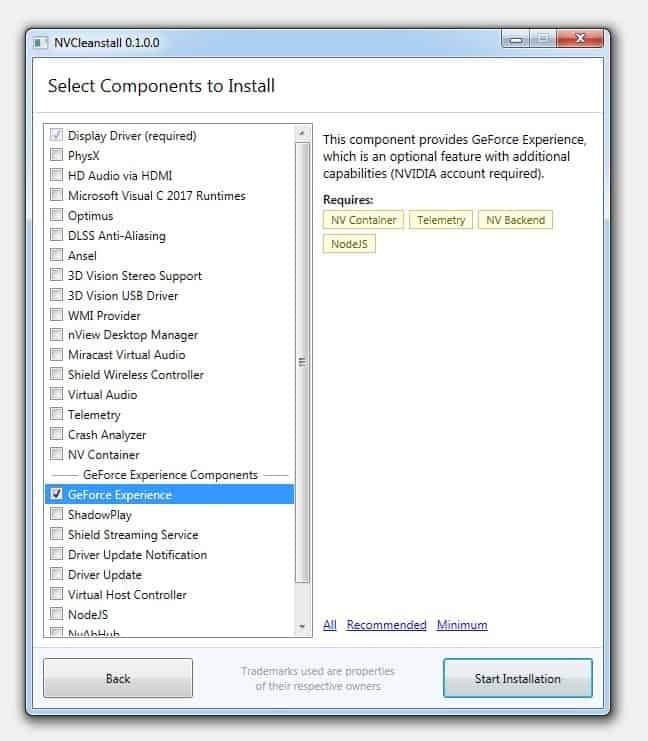 GeForce Experience is optional in the current official installer. As for telemetry, it can be disabled very easily by the user in Windows Services and Task Scheduler (or by using the “Disable Nvidia Telemetry” program). I am wary of these “slimmer” programs, because they might remove something that is required for the driver to work properly. I have used my own solution for nvidia stripping, for years. And the only thing that’s absolutely required for video and games, is the display driver. Everything else is optional. Ok, so apart from the aforementioned Telemetry and GeForce Experience, what else does the driver installs that could be considered as unnecessary bloatware? I like that nvslimmer program that was reviewed here, works great. 1st I downloaded the full driver package from NVidia and used winrar to extract it all into folders. I used DDU first because there’s alot to remove, folders, reg keys, tasks. Then used NVCleanstall. It defaults to downloading drivers so it requests internet access when you open it. (Sorry, dunno you, block) I just pointed it at the folder I extracted from the NVidia package. I selected display driver, physx, Ansel, and NVContainer (you need the last for the NVidia control panel). Once you make your choices and hit install, the NVidia installer opens and does the actual installation. I chose custom and the only options shown where the first two I had picked previously. It worked fine except the ‘HD Audio via HDMI’ still got installed somehow even though I didn’t select it. My vid card supports it though I do not use it. I looked and there’s far fewer folders left behind, and no new tasks. I just tried it and it does what it says. Nvidia’s installer will still be used but without all the bloat. Once I rebooted the computer after the driver upgrade, I ran “Disable Nividia Telemetry v1.2 portable” and it reported, “No telemetry items found for this category”. So, all in all, it does it’s job well. Personly I think that I will wait till its out of beta before I will use it on mine personal W10 system. Hopefully, you will then give us a warning with the latest developments (Good or bad). I do install each time the latest Nvidia driver with a setting who includes not only a clean install setting but also with a not game included preferences. Next, to that, I use the portable program Disable Nvidia telemetry v.1.2.0.24. (’18-10-08). I just started using Chocolatey on my Win10 box to keep my apps up to date. They have a package that strips all the junk from the nvidia drivers if you like a bare driver install which is what I’m doing. I haven’t seen a problem with it yet. This is also much faster than modding the drivers myself.